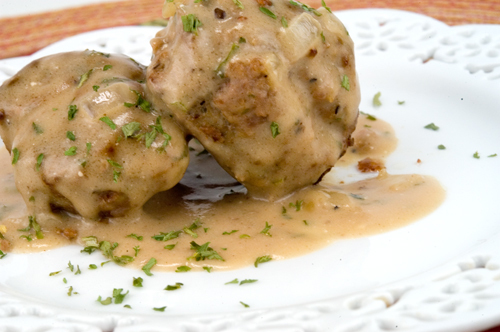 I have had Swedish Meatballs only a couple of times in my lifetime, never mind eaten them. But when I was asked to make them for a church function, I took on the challenge. I researched many recipes, and finally took one from Iron Chef Michael Symons. I was desperately trying to find a recipe that didn’t fry or brown the meatballs ahead of time, as I really don’t care for a browned meatball instead of one cooked in its sauce. Not able to find one, and very skeptical about cooking the sauce with cream and sour cream in it for a length of time, I decided to give in and brown the meatballs as the recipes call for. Wanting to crunch my time (as I always do), I decided to take Martha Stewart’s advice in her recipe and bake them instead of frying. However, I needed to fry some on the top of the stove in a skillet to make my sauce. I got 2 full cookie sheets with my recipe doubled, with maybe 10 extra to fry in the pan. Perfect. I couldn’t decide if I should use bread crumbs as some recipes call for, or bread. Both are soaked in milk, and drained before adding to the meat mixture. I made the sauce according to the recipe, and felt like it needed a flavor boost. So, I sauteed an onion in butter, and added to the sauce mixture. I also added a sprinkle of nutmeg. This recipe looks quite lengthy, but is very, very easy. The meatballs are super easy especially if you use the right tools. I always have on hand disposable food service vinyl gloves (it makes clean up so much easier on your hands), and my spring loaded ice cream scoop is a must when making cookies or meatballs. The meatballs are delicious. 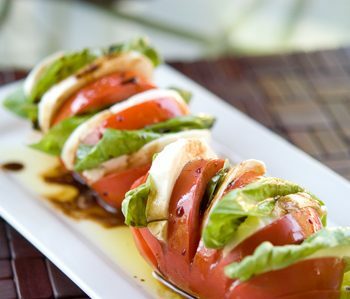 Perfect for appetizers or a full meal when adding cooked noodles or mashed potatoes. In a small bowl, pour the milk over the bread and set aside to soak. Place a saute pan over medium heat, and add 1 tablespoon of olive oil and 1 tablespoon of butter. When the butter has melted, add the onion and garlic with a pinch of salt and sweat for about 3 minutes. 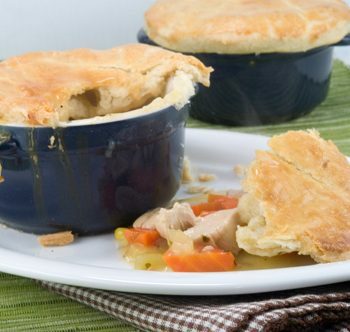 Pour into a large mixing bowl to cool. After a few minutes when the onion mixture has cooled slightly, add meats, the eggs yolks and egg, 3 tablespoons of the parsley and the spices. Season with freshly ground black pepper and 2 teaspoons of salt. Next squeeze the milk from the bread, discarding the liquid and add the bread to the meat mixture. You only want the soaked bread here. Mix until all ingredients are just incorporated. Form your meatballs any size you would like. Traditionally these meatballs are about 3 tablespoons each. I used a number 40 spring loaded ice cream scoop. Hand roll the meatballs, and place on a non-stick jelly roll pan. Save 6 or so to brown in a skillet on top of the stove for gravy. Place meatballs in preheated oven for approx 12-15 minutes. Make sure to turn once in between cooking. While meatballs are baking, make your sauce. Heat a large saute pan over medium high heat. When the pan is hot, add 2 tablespoon of olive oil. Place the meatballs in the pan to sear them on both sides. Add those meatballs to the ones in the oven. In the same pan you seared the meatballs in, over medium high heat, add the 1 medium finely diced onion, along with 2 Tbsp butter. Saute on medium heat until translucent. Add the the flour and whisk until incorporated (add a little more butter if there is not enough fat in the pan to make a roux). Next whisk in the beef broth. Bring this mixture up to a boil, and then reduce to a a simmer. Put the cream into a larger container and add a little hot broth to the cream to temper. Then add the cream mixture to the hot broth, and season with some freshly ground black pepper. Simmer for 5 minutes, stirring occasionally, then turn off the heat and whisk in the sour cream and the other 3 tablespoons of fresh, or 1-1/2 Tbsp dried parsley. Sprinkle with nutmeg. 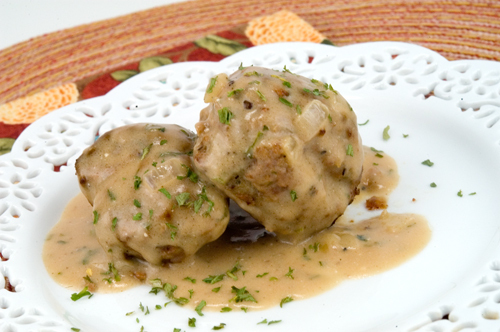 Place meatballs with sauce in a serving dish and serve over your favorite accompaniment. These meatballs are terrific served over rice or noodles.